You will cut unwanted turnover at the knees – without throwing excessive money and perks at people (which is only a stopgap solution anyway). Do you know the difference between "good" and "bad" turnover? How this Chicago-based marketing company uses fun, non-traditional perks and culture-focused job ads to attract employees that want to be lifers. Employee retention boils down to: figuring out what people want, and giving it to them – or allowing them to earn it. And great employee loyalty – the type of retention that wraps a force field around your people, making them impervious to outside advances – only comes when your folks have a lot of good reasons to stay where they are. The good news: managers have tremendous control over this. And most of what good employees want – won't cost you a dime. Zero turnover is a fantasy. And not even the goal. Change is often necessary – for the company and the employee. So a spoonful of turnover is okay. The answers lie within the pages of this Blueprint. All you have to do is consume, digest and apply the research-based, not-as-hard-as-you-think principles of employee retention that are diligently laid out in this field guide for managers. ResourcefulManager’s “The Employee Turnover Cure” Blueprint comes with an unconditional, 100% money back guarantee. 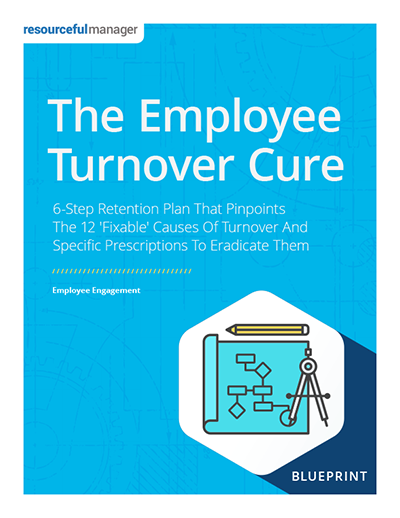 If you decide “The Employee Turnover Cure” Blueprint doesn’t deliver value or simply isn’t your cup of tea, just email us at contact@resourcefulmanager.com within 90 days, and we’ll process your complete, no-hassle refund in 1 business day or less.